Soviet places a Russian 1-1-2 infantry in eEur3311 (Dnepropetrovsk). Two Russian 1-1-3 cavalry are placed in eEur3613 (Kharkov). Russian 0-1-1 infantry is placed in wPac5727 (Blagoveshchensk). Russian 0-1-1 infantry is placed in ePac5301 (Vladivostok). Mongolian 1-1-2 Exp cavalry is placed in wPac5621 (Ulan Bator). Only one unit may be converted into a Line Fortress per turn. In that case, just Minsk. Soviet replaces a Russian 1-1-2 infantry in eEur3906 (Minsk) with a Russian 0-3-0 Line fortress. A Russian 1-1-2 infantry in eEur4608 (Leningrad) is moved to eEur4307 (Pskov). A Russian 1-1-2 infantry in eEur3109 (Odessa) is moved to eEur3506 (Zhmerinka). Japanese Troop Convoy in the South China Sea is returned to the DS Axis Force Pool. Map, DS Axis Force Pool, Soviet Force Pools, and Current and Pending Options updated. Axis flips Bilbao to Nationalist Control. Two Japanese 1-1-1 infantry in wPac4321 (Canton) are combined into Japanese 2-1-1 CEx HQ. Japanese 2-2-1 infantry in wPac5022 (Taiyuan) is broken down into two Japanese 1-1-1 infantry. Japanese 3-3-1 infantry in wPac5121 is broken down into a Japanese 2-1-1 infantry and a Japanese 1-1-1 infantry. Japanese Detachment placed in wPac5022 (Taiyuan). Japanese Troop Convoy is placed in the Yellow Sea. A Japanese 1-1-1 infantry in wPac5022 (Taiyuan) is moved to wPac5223 (Peiping). Japanese 2-1-1 infantry in wPac5121 is moved to wPac5022 (Taiyuan). Japanese 2-2-1 infantry in wPac4921 is moved to wPac4922 (Changchow). Japanese 3-3-1 infantry in wPac4922 (Changchow) is moved to wPac4823. Japanese 2-2-1 infantry in wPac4823 is moved to wPac4824. Japanese 1-1-1 infantry in wPac4725 (Shanghai) is moved to wPac4625 (Ningpo). Japanese 1-1-1 infantry in wPac4324 (Taihoku) is moved to wPac4725 (Shanghai) through the Yellow Sea. Japanese 3-2-1 Nor HQ in wPac4922 (Changchow) is moved to wPac4923 (Kalfeng). Kwantung 3-3-1 infantry in wPac5226 (Mukden) is moved to wPac5326 (Hsinking). Kwantung 3-3-1 infantry in wPac5224 (Chengteh) is moved to wPac5225. An attack is declared against wPac4724 (Nanking). One Right Column Shift is provided by attacking HQ. One Left Column Shift is provided by attacking a City. Map and DS Axis Force Pool updated. 0 strength units can't attack, so you'll have to lose something else. I'll lose the reserve step. Axis reduces the Japanese 2-2-1 infantry in wPac4824 to a 1-1-1 infantry. Western eliminates the Kiansu 0-1-1 Res infantry in wPac4724 (Nanking). Kwantung 3-3-1 infantry in wPac5326 (Hsinking) is moved to wPac5427 (Harbin). Kwantung 3-3-1 infantry in wPac5225 is moved to wPac5226 (Mukden). Map and DS Western Force Pool updated. Conditional: Place 0-1-1 Res in Nanking. 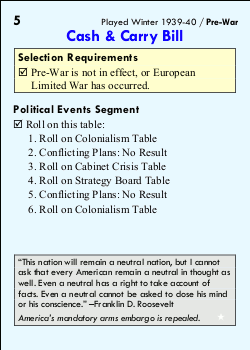 Also, I don't think you rolled for the conditional on Western Guarantees last turn. Hmm, looks like you're right. I'll roll twice for it this turn. In wPac4724 (Nanking), Kiansu 1-1-1 Exp infantry is flipped to 0-1-0 Def fortress. In wPac4720, Nationalist Chinese 0-2-1 KMT HQ is moved to wPac4621. 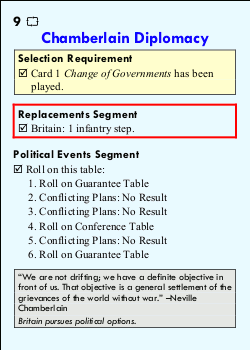 League of Nations Conditional Event: Nationalist China receives an infantry step. Kiansu 0-1-1 Res infantry is placed in wPac4724 (Nanking). Map, and DS Western Force Pool updated. 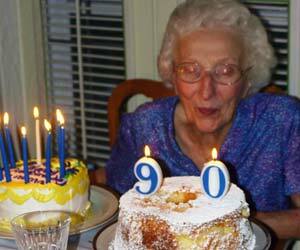 Been busy all weekend - will post my turn in the morning. Nothing I need to do. 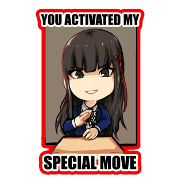 Also, I'm going to be out of town for a little while - I don't want to hold the game up, is there anyone in waiting who would want to take the reins for a while? If so, great, if not, I'll see what I can do. Turn is advanced to Mar-Apr 1939. Western, would you like to send your Aid to China marker to the Western or Soviet Conditionals Box? Western Aid to China marker is placed in the DS Western Conditionals Box. Allied Crusade marker remains in the 1VP box. Allied Crusade marker remains in the 0VP box. 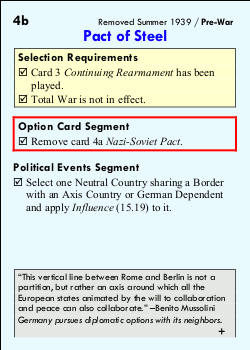 Axis reveals Nazi-Soviet Pact and Second Army Expansion. Pact of Steel, Economic Expansion, and First Navy Expansion are removed. TK Russia's posture is Treaty of Rapallo; the Posture of TK Russia and TK Soviet Minors is changed to Nazi-Soviet Pact. 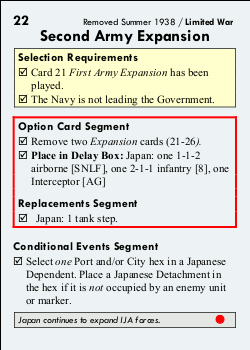 A Japanese 2-1-1 infantry, a Japanese 1-1-2 Airborne, and a Japanese Interceptor are placed in the DS Delay box. 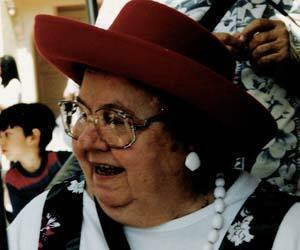 Map, DS Western Organization and Conditionals, and Current and Pending Options updated. Place the tank step in Nagasaki. Form 2-2-1 from steps in Shangai. Axis places a Japanese 1-1-2 armor in ePac4801 (Nagasaki). Japanese Troop Convoy in the Yellow Sea is returned to DS Axis Force Pool. 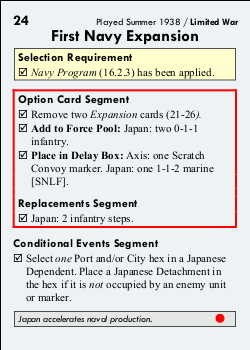 In wPac4725 (Shanghai), a Japanese 1-1-1 infantry is flipped to a 2-2-1 infantry; a Japanese 1-1-1 infantry is returned to the DS Axis Force Pool. Japanese 3-3-1 infantry is moved from wPac4823 to wPac4824. Japanese 2-1-1 infantry is moved from wPac5022 (Taiyuan) to wPac4923. Japanese 0-1-1 Colonial infantry is moved from wPac4825 to wPac4924 (Tungshan). Kwantung 3-3-1 infantry in wPac5427 (Harbin) is moved to wPac5526 (Tsitsihar). Axis declares an attack against Nanking. One right column shift is provided by Ranged Support from HQ. Two left column shifts are provided by attacking a Fortress and attacking a city. Remove the step 1-1-1 underneat the 3-3-1. 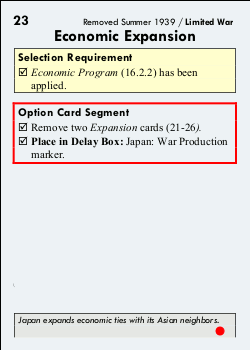 Axis eliminates the Japanese 1-1-1 infantry in wPac4824. Axis moves Kwantung 3-3-1 infantry in wPac5526 (Tsitsihar) to wPac5626. Kwantung 3-3-1 infantry in wPac5326 (Hsinking) is moved to wPac5327 (Changkufang). Japanese 0-1-1 Col infantry in wPac4924 (Tungshan) is moved to wPac4923 (Kalfeng). 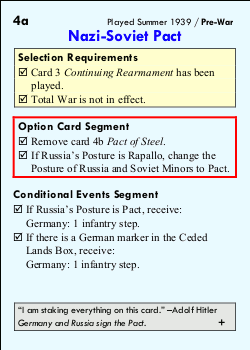 Russia's Posture is Pact and there is a German marker in the TK Ceded lands box; German receives two infantry steps. Japan may place a Detachment in a Japanese Dependent. Map, DS Axis Force Pool, DS Western Force Pool updated. Axis places a Japanese Detachment in ePac3612 (Eniwetok). Two German 1-2-3 infantry are placed in wEur3922 (Hambourg). Western reveals Chamberlain Diplomacy and Cash & Carry Bill. Map, Axis Force Pools, and Current and Pending Options updated. DS step is the Kiangsu Res unit in Nanking. Use the Res unit in Nanking to flip the 0-1-1. If aid to China is successful, put the Res unit in Wuhan. Does France have any actions for the turn? Just build the last maginot line fort. Western places a British 1-2-2 infantry in wEur3916 (London). In wEur3420 (Strasbourg), French 0-1-2 infantry is replaced with French 0-5-0 Mag Fortress. 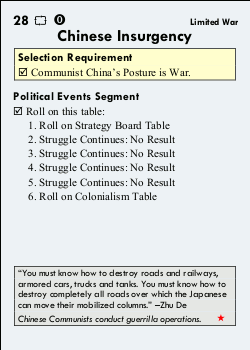 In wPac4724 (Nanking), Kiansu 0-1-1 Res infantry is removed and Kiansu 0-1-1 infantry is flipped to 1-2-1 infantry. In wPac4722 (Wuhan), Kiansu 0-1-1 infantry is removed and Kiansu 1-1-1 infantry is flipped to 2-3-1 infantry. Soviet reveals Continuing Rearmament and Chinese Insurgency. Pacific Commitment may be applied. 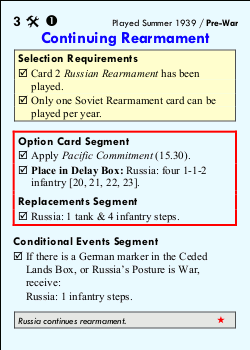 Four Russian 1-1-2 infantry are placed in the TK Delay box. Map, Western Force Pools, and Current and Pending Options updated. 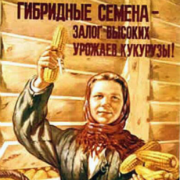 Cool Corn has requested that someone take over the Soviets from him for the foreseeable future. Anyone have an interest?